Cecil King, RI RBA ROI RSMA (1881-1942). Oil on board signed and annotated MALTA. (Verso, titled "In Grand Harbour Malta" and dated February 1928). Standard size: 16.5 x 12.5 inches (42 x 32 cms) approx. 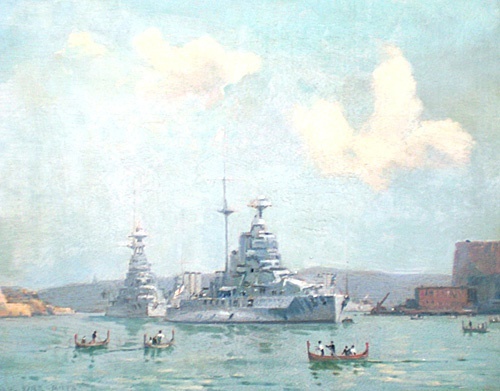 A familiar scene for those who knew Malta between the wars, Cecil King has painted Grand Harbour with two battleships of the 1st Battle Squadron, Mediterranean Fleet and two heavy cruisers enroute to join the 5th Cruiser Squadron, China Station. In the foreground, dghaisas glide across the mirror smooth waters of this most favourite base of the Royal Navy. Centre stage is the flagship of the Mediterranean Fleet, HMS QUEEN ELIZABETH (Captain T N James MVO RN) wearing the flag of Admiral Sir Roger Keyes Bt KCB KCVO CMG DSO, Commander-in-Chief Mediterranean. QE had only recently arrived on station and hoisted the C-in-C’s flag after undergoing a major refit in Portsmouth and social precedent, always regarded as important at the time and especially carefully observed in the Med Fleet, must have elicited much amusement at formal mess dinners for the wardroom officers in the flagship of that fleet! The Service ranks of the Commander-in-Chief Mediterranean Fleet and Lieutenant Commanders Sir William Bowyer Smyth (both mere baronets), and The Hon C A St V Curzon Howe and The Hon C E R Spencer were all pipped in social precedence by a mere lieutenant, the Assisistant Fleet Wireless Officer Mediterranean Fleet, Lieutenant Lord Louis Mountbatten. Even if he had been styled His Serene Highness Prince Louis for the first 17 years of his life until that title was swept away by King George V in 1917, Mountbatten in turn was now roundly put in his place of precedence by the gunroom which fielded Sub Lieutenant Viscount Borodale (Admiral Beatty’s son), as well as Midshipmen Lord Beresford and Lord Cecil. And then there were Midshipmen Sir Michael Culme-Seymour and a couple more Hons! Notwithstanding being socially outranked by subs and mids Mountbatten, we know, would have loved these intricacies of correct form and precedence, a subject which held great fascination for him all his life. Astern of the Fleet flagship lies HMS WARSPITE (Captain J F Somerville DSO) flagship of Vice Admiral Commanding 1st Battle Squadron, Vice Admiral J D Kelly CB. HMS VALIANT (Captain J W Carrington DSO RN) and HMS BARHAM (Captain H S Monro DSO RN) the other two ships of 1BS, have not been included in the painting and were perhaps away at sea but Cecil King has added two rare migrating birds, ships not seen before in Grand Harbour for they were only just commissioned for the first time and were enroute to join the China Fleet’s 5th Cruiser Squadron: the distinctive three funnelled BERWICK and CUMBERLAND (BERWICK is seen over QE’s stern and CUMBERLAND over QE’s focsle). HMS BERWICK (Captain R S Wykes-Sneyd DSO RN) had commissioned at Devonport on 27th July 1927 and had conducted first of class trials before being earmarked for the China Fleet. She was followed into commission by HMS SUFFOLK (Captain N O’Neill RN), HMS CORNWALL (Capt the Hon W S Leveson-Gower DSO RN) and then HMS CUMBERLAND (Captain A L Snagge RN). BERWICK and CUMBERLAND sailed from UK shortly after Christmas 1927 and having spent a few weeks in the Mediterranean - where working up was more easily achieved than in the depths of British winter weather - they sailed for China where they arrived in April 1928. Captain Cecil George Charles King TD painted for the Sphere and Illustrated London News and his sea paintings are represented in the Imperial War Museum, London and in the Paris Musee de Marine. He was vice -president of the Society of Marine Artists and was Marine Painter to the Royal Thames Yacht Club in Knightsbridge. The author of several books about the Royal Navy, he was considered to have “an extensive knowledge of naval lore” (Obituary, The Times 10 December 1942). He had served in the trenches of World War 1 but the sea was, we are told, his first and abiding love.